Google created a lot of buzz in the SEO circles last month after news of its Mobile first Index finally being part of its algorithm was known. Garry Illyes clarified (again) that the update is months away (still). He went on to add that SEOs and webmasters need not freak out. However, it’s not a bad idea to get ready. Is it? Why was this update necessary? What strategies should I employ to stay ahead of the Mobile-first Index roll-out? However, before I dive deep and answer these questions (and a few others), let me explain what Mobile first Index actually means. Indexing is a process by which Google lists, stores and arranges all the webpages on the internet for it to be shown against search queries. Google is now going to index the mobile version of your site first instead of the desktop version. This preference of mobile over desktop is Mobile First Indexing. Now that you know what Mobile First Indexing is, let me give you a little background on how Google might have decided to follow this approach. With the shifting search pattern from desktop to mobile since 2015, when Google announced that mobile search has overtaken desktop in the US, this update wasn’t that big a surprise. Going by the trend, I’m actually wondering why it took them this long to make it happen. Considering, Google is known to align its update with user behavior, Mobile First Indexing seems to perfectly fit the bill. With Internet usage in developing countries largely driven by Mobile and Google being the dominant search engine by a big margin, Mobile-first Indexing helps cater to its majority audience. As of now, web pages are indexed based on their desktop version. The problem with this is that webmasters and SEOs emphasize on improving the site’s desktop version to improve rankings. Mobile version often gets ignored. Websites optimised based ONLY on desktop usage pattern might not give the ideal User experience to mobile users. Considering mobile users continue to outnumber desktop users, the gap increasing even further, it is natural for search engines to give preferential treatment to mobile. This move can also be seen as Google’s push to make website owners optimize their desktop as well as mobile versions. Google, after all, is known to resort to such antics to make sure SEOs toe its line in following the best practices. What about businesses without a mobile website? Well, Google says there’s no need to panic. Google has also clarified that websites which do not have a mobile version, their desktop version will be indexed. However, it would be fair to assume that this might change in the future and you’ll have to cater to any future algorithmic changes that would make mobile index mandatory. There’s no need to panic (as of now). However, it would not be a bad idea to optimize your website for mobile users. 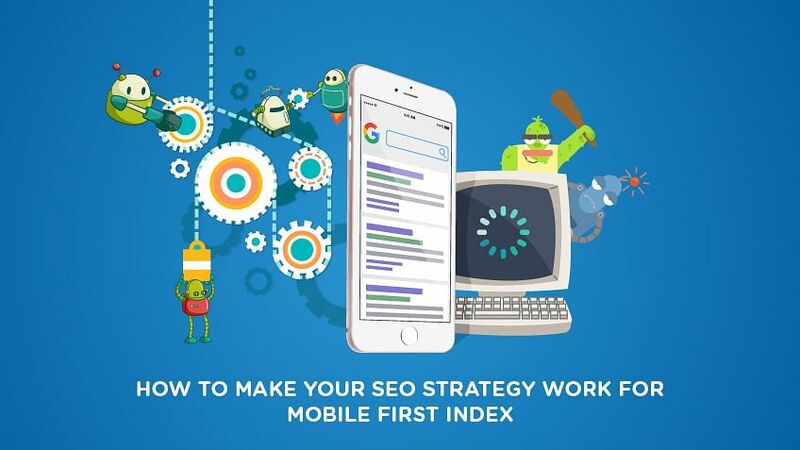 What will be the impact of Mobile first Index on SEO? Being slow will not get you anywhere: If you have a slow mobile experience currently, you might want to consider putting work into the mobile page loading speed. Focus on user experience over SEO parameters: Marry UX and SEO to reap rewards as search engines want you to focus on the user instead of robots. Reduced use of lightbox ads/interstitial ads: Bid Goodbye to all the fancy lead-generation popups that might be troubling the users. If you don’t specifically need a mobile website, make the desktop version of your site responsive. This will help you stay ahead of the Google update without any additional effort. It is also helpful in bringing uniformity in the way content is served on the mobile as well as the desktop site. The Gold Standard for mobile page speed set by Google happens to be less than one second for Above-The-Fold (ATF) content to help the user interact with the page. Of course, this is what is known as the ‘Gold Standard’ of page load speed. Four seconds is the acceptable standard for a page load. There’s a good chance that a user might be dissatisfied with the page, or worse, might leave if it takes a longer time to load. However, there are still many websites that seem to prefer a fancy UI over the page load speed. Yes, Accelerated Mobile Pages! Coz Accelerated, Duh! Fast loading pages will give you an edge by loading pages faster and bring you in the good books of the big G.
If you’ve been procrastinating all this while to review those errors that throw up on the search console, then it’s high time, you took it up. Head over to https://search.google.com/search-console/mobile-friendly and run your website URL and find out if it passes the Mobile Friendly test. Ensure that all the errors, if any, are taken care of immediately. Ensure the content is easily accessible to users and not hidden under accordions for them to click and read. Think of your content placement with respect to mobile and how it’d impact the mobile user experience of a page. Right from clicking on the URL to landing on your page to loading time to being able to satisfy the user’s purpose, ensure the availability of content isn’t an issue for users to navigate. -Layouts that make above the fold content appear to be an interstitial while original content lies at the bottom. However, legally obligated popups like cookie notification or log-in information to access indexable/private content is not a part of it. Even pop-ups that take a limited space on mobiles are considered okay. Google had earlier clarified that it would index content that is part of accordions. Optimizing on-page elements is essential. Even without Mobile-first Index looming over our heads. But it becomes even more critical to have everything in place. Pull up your socks and verify if the Meta Data, interlinking, image attributes, etc. are in their place. And if not, then get to work, my friend, because this is important. Increasing discoverability and ensuring that search engine bots are able to access your site’s content should be a priority. Structured markups are essential to help bots discover content on your page. Usually, desktop versions of the sites are marked up properly and the mobile version is ignored. Because, of course, the page load time gets affected with markups and it made sense to skip this practice on mobile. However, with Mobile-first Index, this calls for a change. You need to ensure that the essential data markups are present in the mobile version of your web page. Sure, you can skip the non-critical ones, when compared to the desktop version of the same web page, if you fear it’ll make the page size heavy and slow down the load time. Load time takes precedence, anyway. Alibaba and Flipkart implemented Progressive Web Apps (PWAs) and saw a jump in the time spent on their pages. Not only have the conversions increased, but they’ve resulted in less data usage. This seems to be a good enough reason for consumers to use this, especially in developing countries where Internet connections seem to be on the slower side. Now, all that is good. But what exactly is Progressive Web Apps? This can be one of the strategies that can be implemented. If the strategies stated above appear alien to you, there’s help available in the form of Market Motive’s Mobile Marketing course which you can check it out. This is indeed a welcome step from Google’s end to ensure that the user gets benefited and brings SEO good practices to focus. Although the update is months’ away from being implemented, it’d be wise to get started on this. Share your thoughts about this move by Google and how it will impact you in the comments below.